The most popular Christmas songs on the radio? 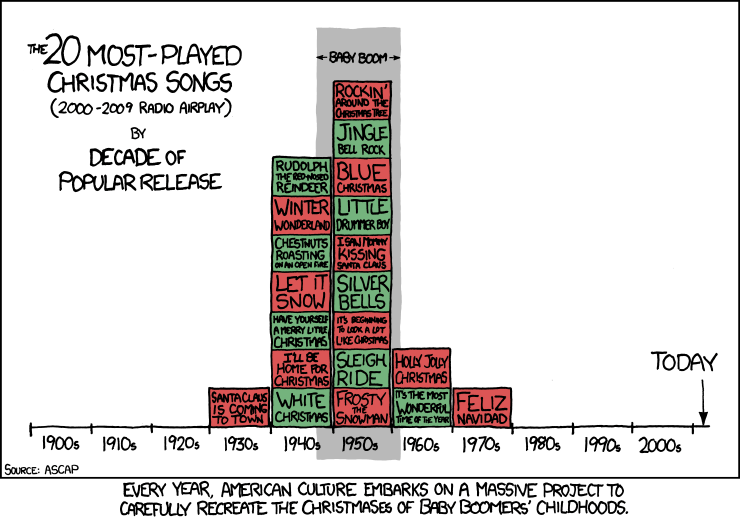 This cool infographic — citing data from ASCAP — says Rocking Around the Christmas Tree, Jingle Bell Rock and Blue Christmas were tops from 2000-2009. But hey, where is Santa Baby by Eartha Kitt…. and how about Bruce Springsteen doing Santa Claus is Comin’ to Town, which I’m thinking is ’90s? Also, I don’t think it’s a “Massive Project to Carefully Recreate the Christmases of Baby Boomers’ Childhoods” — I think we just like playing music… we like Christmas… and the best Christmas songs came from this era! Thanks to xkcd.com for this rockin’ graphic. What is your favorite retro Christmas song? There’s a problem with the above article, in that it leaves out a HUGE number of very popular Christmas songs which get a lot of radio play, the most noteable being Carol of the Bells, Silent Night, and, O Holy Night, among others which find their origin long before the chart.